Very important part of planning is decision which type of wedding ceremony you would like to have. You can choose between civil and church wedding ceremony. You can combine both or have just one of them. If none of those would suits you, you can also decide for symbolic wedding or simply celebrate some other occasion (Engagement, Vows renewal or Anniversary). A civil wedding ceremony is basically a legally approved marriage ceremony that contains no religious aspects. You can edit your civil ceremony in a way which will really mean something special to you. You may want to include your own words or famous quotes, words of famous authors or poets in your vows or readings. Or add a symbolic act to your ceremony. Even Your own choice of music. You can incorporate anything you like so that it is even more personal and special. If you have always dreamt of a church wedding, where you can say your vows to your partner in the presence of God’s grace, maybe in some new, special venue… Well, you have come to the right place. Slovenia is a country with rich religious customs and many lovely churches throughout the country. 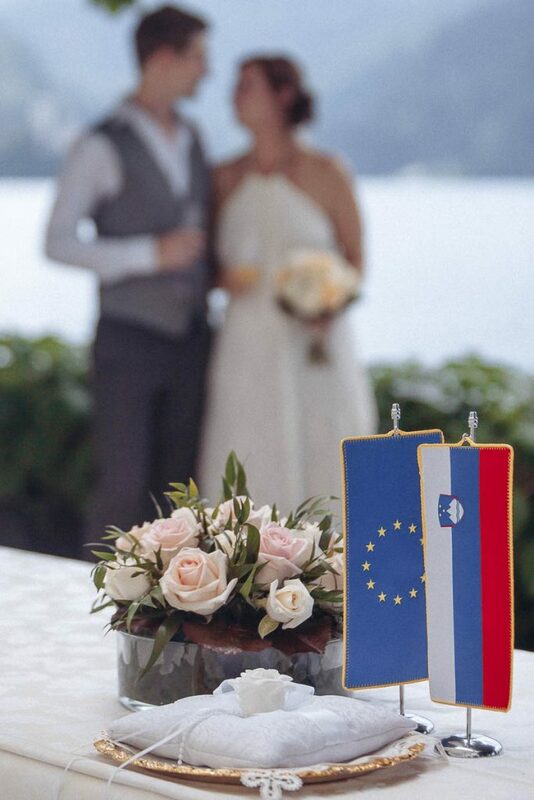 In a Slovenian church, you can have a Catholic, evangelical or orthodox wedding ceremony. However, please note that church weddings are never held on Holy Thursday, Good Friday or Holy Saturday. “Marry me, Kiara,” he blurts out in front of everyone. “Why?” she asks, challenging him. What can be more romantic than being asked to get married by your loved one in a special place? And Lake Bled is definitely that. Many couples decide to celebrate and reaffirm their love for and commitment to one another by renewing their marriage vows, either privately or publicly, by saying the famous words “I do” once more. If you are one such couple and are looking for a special place, Lake Bled and its surroundings are the perfect locations. We will prepare an unforgettable symbolic ceremony for you, either in one of our countless churches or in some green and romantic setting. Perhaps you want to give your husband or wife a special anniversary present and to celebrate in style but are not sure what or where for that perfect surprise. We are here to give you some ideas and help you make your idea a reality.